It was a true quantum leap: when BMW unveiled the Z1 to the international motoring press in the Italian town of Punta Ala back in autumn 1988, its direct predecessor was parked in the hotel’s inner courtyard – a BMW 507 from the late 1950s, the last time the BMW model range had included a two-seater sports car. The leap through time to the Z1 was in fact even greater than the intervening period of 30 years or so would suggest. Its avant-garde solutions looked way ahead into the future – indeed, some of its most revolutionary ideas are as unique now as they were then. It had all begun with a very bold idea. The BMW Board of Management came up with the notion of setting up a kind of think tank in a cutting-edge company branch that would be completely isolated from all other development departments. The idea was to give highly skilled BMW engineers, technicians and designers free rein to work on turning their best creative concepts into reality themselves. At the start of 1985, the idea came to fruition. Not five minutes’ drive from the Group’s headquarters, a highly dedicated high-tech company came into being that has long since become a role model the world over: BMW Technik GmbH, known internally simply by the letters ZT. Just six months later, the 60-strong team delivered exactly what had been hoped for: concrete concepts designed to inject car manufacture with new impetus, all under the umbrella of a pilot project for employing new materials, using different types of vehicle structure and shortening development times. It didn’t take long to coin a name for it: the Z1. Pilot project sells itself: Z1 looks increasingly likely to go into production. One glance was enough to know exactly what the superbly proportioned sporty two-seater was meant to build on: there were increasing calls from customers for a roadster that would continue the legacy of BMW’s legendary sports cars of the past. The 328 and 507 had long since gone into the history books as sporting and style icons, and there had been nothing to take their place for several decades. It was time to fill the gap with something right up to date. As the press release stated: “BMW Technik was commissioned by the Board of Management of BMW AG to devise and execute a vehicle concept which would largely satisfy the desire for ‘freedom on four wheels’, driving pleasure and performance.” The fundamental driving experience should clearly take precedence, rather than adopting the comfort-focused approach that prevailed in competitors’ sports car concepts throughout the 1980s. “Young”, “dynamic” and “brash” should be the words that best described the Z1, along with “a new dimension in driving”. Trademark BMW roadster attributes were adopted and fused with the latest technology. Ingredients included superior performance, the ability to drive with the roof down, a sense of sheer originality and a dash of extravagance. The Z1 had all the right credentials: low weight and low centre of gravity, front mid-engine and compact dimensions. The highlight though was without doubt its pioneering technology: the unique vertical sliding door concept and the supporting sheet-metal structure with a plastic outer skin. Demand wins the day: the roadster is to be built – by hand. The response was overwhelming – the company was inundated with inquiries from customers, while there was a great deal of public speculation about whether BMW had the courage to actually build the car. Whereas BMW kept silent on the matter, development for series production was already in full swing behind closed doors. It was obvious that the Z1 would have to be built largely by hand on account of its unusual design characteristics and the materials used. This, in turn, meant a small production run and a high price tag. Nevertheless, the BMW Board of Management pushed ahead with the launch. The ink had barely dried on the announcement when the advance orders started to stream into Munich. The Frankfurt Motor Show hadn’t even started when a major motoring magazine wrote: “The groundswell of euphoria gives reason to suspect that the last person to place an immediate order won’t get their hands on their Z1 until the year 2000!” BMW gave a small group of top journalists a preview of just what would make the new roadster one of a kind. The Director of BMW Technik GmbH at that time, Ulrich Bez, gave an emphatic demonstration of the benefits of the plastic panelling: he jumped with both feet onto a vehicle wing lying on the floor, which promptly buckled – then sprang back to its original shape when he stepped off it again. BMW’s historic 1987 Frankfurt Motor Show: first V12, first 3 Series Touring, first Z Roadster. When the show finally opened its doors on 11 September, visitors descended on the BMW stand in their hoards to behold a unique collection of firsts all set to go down in motoring history: the 750i powered by Germany’s first post-war 12-cylinder engine was marking its world premiere, as was the first ever 3 Series Touring as it blazed a trail for a whole new breed of car, and, of course, the avant-garde Z1, the first BMW roadster for around 30 years. Set off to stunning effect by a wall of water as a backdrop, a German news magazine deemed it “probably the most photographed vehicle at the entire show”. With so many customers desperately eager to be among the first to order a Z1, a German motoring magazine decided to try its luck at buying the Reed Green exhibit straight off the stand. But despite being offered DM 150,000 in cash, the BMW team stayed firm: it was simply not possible, as the Z1 was one of just ten test vehicles, all of which were still urgently required. Besides this, the Z1 still had to undergo homologation testing, so the roadster could not have been sold under any circumstances – not even for the two million German marks the prototype had actually cost! And so the waiting game started – and went on for a good year, as it would be autumn 1988 before the Z1 went into production. The planned asking price was DM 80,000. In the meantime, the potential clientele could seek solace in the first sales brochure entitled “For sheer driving passion: the BMW Z1 High-Tech Roadster”. October 1988: the Z1 – a radically different approach to development and construction. The Z1 truly was different from the ground up. A self-supporting monocoque construction made up of individual sheet-steel parts constituted the car’s backbone. After it had been welded together, the entire frame was hot-dip galvanised in an immersion bath. Not only did this ensure seamless corrosion protection for the monocoque, it made it substantially more rigid too: the coating of zinc that was applied acted as a connecting and supporting element, especially around panel seams and joint overlaps. The effect was an increase in the monocoque’s torsional resistance of around 25 per cent. The second peculiarity of the Z1 bodyshell was the vehicle floor, which was bonded with the frame and partly bolted to it – and made of plastic. In collaboration with specialists from MBB – now merged into EADS – the Z1 engineers had developed a material which combined low weight with high load-bearing capacity, was immune to corrosion, safe in a collision, and produced smooth underbody contours. The solution was a combination of fibre-composite materials sandwiched together. The resulting structure of two layers of glass fibre-reinforced epoxy resin with polyurethane foam in between produced a floor assembly with a weight of just 15 kilograms. This construction had the added advantage that the floor unit could be preassembled separately before being completely bonded with the vehicle frame as well as bolted to the steel structure at certain points. Special bracing incorporated into the sandwich structure enabled high forces to be applied in the vicinity of chassis mounting points and seat mountings, for instance. Indeed, the floor assembly increased the monocoque’s static torsional resistance by a further ten per cent when installed. With the additional help of the high, oversized side sills and the engine mounts, this structure stood out for its exceptional strength and outstanding accident safety. A transverse tube in the dashboard area combined with the tube used to reinforce the windscreen frame to ensure highly effective protection in the event of a side-on collision, too. And as the tube inserted into the windscreen frame formed a direct connection between the two A-pillars, it also doubled as roll-over protection. New outfit in one hour flat: fully bolted outer skin of plastic panels. Although the monocoque was roadworthy as it was, it was cloaked in plastic: indeed, the Z1 was the first model ever to feature a plastic exterior whose vertical parts were all made of injection-moulded thermoplastics. Resilient and proven to be immune to damage, the panels were bolted into place. In theory, with a complete second set of outer panels it would have been possible to convert a Z1 from red to blue in the space of an hour using nothing more than a screwdriver. Different types of plastic were used for the panelling parts depending on their task. The front and rear sidewalls, the doors and the side sill covers were made from a high-tech thermoplastic that was renowned for its high impact strength, almost completely eliminating the risk of bumps and dents resulting from minor knocks. The panelling for the front and rear bumpers, on the other hand, possessed very different properties – the highly elastic plastic used here was able to fully regain its former shape following impacts at up to 4 km/h (2.5 mph). The bonnet and boot lid as well as the soft-top compartment cover were made from special fibre composites. During the production of these plastic components, different glass fabrics (depending on the demands that would be placed on the component), foam core sections as well as the necessary fastenings, such as bolts and braces, were placed into the mould in a dry state. Once the mould had been closed, epoxy resin was injected into it and compressed while being subjected to carefully controlled temperature sequences. Components manufactured in this way combined excellent surface quality and high strength with precisely defined energy absorption in the event of an accident. Despite these advantages, the BMW engineers acknowledged that “it would appear impossible in the foreseeable future to use a larger amount of plastic for making the exterior of mass-produced vehicles”. Special paintwork system with three different degrees of hardness. The four possible paint finishes for the Z1 were not mere colours bearing the highly descriptive names of nature Green metallic, Dream Black metallic, Fun Yellow and Top Red, their chemical composition was different too. Development work carried out in collaboration with the suppliers had led to the creation of the Varioflex paintwork system, which catered to all the requirements when applying the paint to different plastic materials. The conventional painting techniques for metal at that time hardly placed any special requirements on the paint in terms of its flexibility, as it was relatively easy to obtain a high surface gloss and keep the colour consistent. Due to the differing requirements depending on the specific component involved, the various plastic materials used on the BMW Z1, on the other hand, called for a paintwork system offering three different levels of flexibility: high flexibility for the bumper and side sill panelling, medium flexibility for the doors and wings, and a hard coating of paint – just like on a metal body – for the bonnet, boot lid and soft-top cover. While all components received the same base coat providing the actual colour of the car, the parts were then painted with different clear coats, depending on the degree of elasticity required. Unequalled even today: vertical sliding doors. Viewed from the outside, the Z1 therefore had all the makings of a sophisticated-looking, but ultimately conventional roadster – if it hadn’t been for its doors. These retracted electrically into the side sills, allowing both driver and passenger to cruise along with the door open if they wished, a feature which has never been emulated since. “The car is so low and the flanks so deep that the driver of the new model is able to effortlessly pluck sweet clover, plantains and other ground-hugging greenery from the wayside by simply leaning out,” as one news magazine reported. What’s more, this particularly refreshing form of travel was both perfectly safe and legal into the bargain thanks to the ample side protection provided by the high sills. The mechanism for the doors and side windows was driven by two electric motors and a toothed belt. The motors incorporated a freewheel function to allow the doors and windows to be operated manually if necessary. To avoid burdening the actual door with additional weight, all of the electrical and mechanical components were integrated in the car’s body. A double mechanical lock acting on the doors in both opened and closed position prevented rattling noise and excessive door movement while driving. The side windows could, of course, be lowered separately from the doors: after the doors had been opened and closed again, the windows automatically returned to their previous position. Sports car devoid of wings and spoilers: a paragon of aerodynamic design. The Z1’s appearance belied its true sporting talents. Originally conceived as an automotive test laboratory, outstanding aerodynamics had been a top priority for development. The aim was to meet these targets without using the customary aerodynamic aids at that time such as spoilers and wings; instead, the basic shape of the vehicle itself, including the underbody, was intended to achieve the desired results. The very flat front end of the Z1, the smooth transitions on its bonnet and the windscreen raked at an angle of 62° provided all the right ingredients for a smooth flow of air along the top of the car. The vehicle’s perfectly smooth underbody formed a virtually continuous surface extending from the front end through to the rear axle. The underside of the vehicle rose slightly towards the rear in the form of a diffuser, thereby directing the airflow at the transverse rear silencer, which was shaped in the form of a wing to help reduce rear axle lift substantially. The car’s looks made no secret of the fact that it was something quite special. After all, one of the highlights of the innovative Z1 concept was an up-to-date and highly attractive interpretation of the roadster concept. It marked a departure from the long, elongated shape of classic roadsters, featuring instead short overhangs as well as a compact overall length relative to its wheelbase. The joints along the side panels were quite different from the conventional design at that time. The new door concept produced a wide, joint-free side sill with an elevated entrance height, with the upper edge of the bumpers and side sills forming a continuous line. 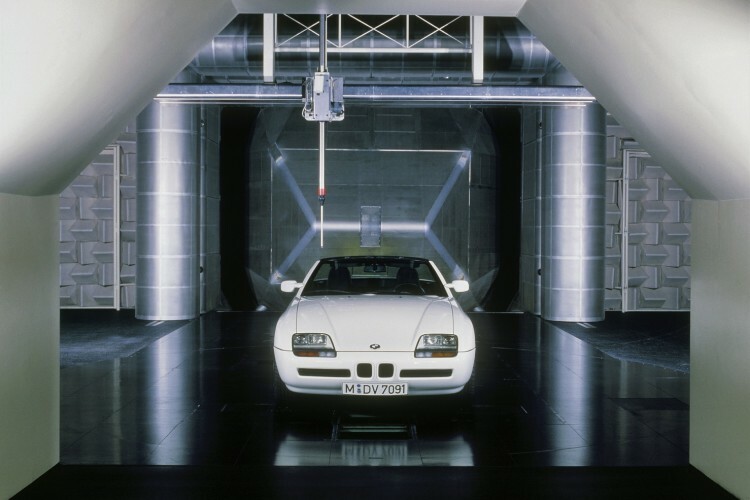 The Z1 was tapered in around the doors, giving the wings a broad and flared appearance that was reminiscent of the M3. The BMW kidney grille also sported an updated look, as it was fully integrated in the front bumper’s contours, making it look smaller and more compact. The new BMW roadster’s interior appointments were highly functional in nature but, above all, very upmarket: the seats and door panels were all trimmed in new high-class materials combined with fine leather. The low-slung seating position, bulky transmission tunnel and wide sills called for a new technical concept for the Z1 seats, so the roadster was fitted with bucket-shaped all-foam seats affording the high levels of lateral support needed to be able to put the sports car’s outstanding cornering abilities to the test. Plastic shells painted to match the car’s colour enveloped the seat backrest, which had the headrest integrated into its outline. The driver’s seat was height adjustable, and the passenger seat could be tilted forward to make better use of the through-loading facility. Low centre of gravity, broad stance: “supreme driving pleasure”. The powertrain and chassis of the Z1 were largely inherited from the 3 Series. Hard at work under the bonnet was the classic BMW straight-six engine, which mustered 170 hp from its 2.5-litre displacement and was fitted in a front-mid position. A central aluminium tube ran from the five-speed manual gearbox to the rear differential to produce a torsionally and flexurally rigid link between the two. The single-joint spring-strut front axle taken from the 3 Series handled the task of wheel location at the front, but a brand new construction was employed at the rear: a multi-link axle comprising two transverse control arms and one longitudinal control arm. It was dubbed the “Z-axle” in German, which was shorthand for “centrally guided, spherical double-wishbone axle” rather than a reference to the new model’s name. The kinematic arrangement of the three control arms ensured excellent directional stability as well as effective anti-squat and anti-dive control. This configuration endowed the Z1 with go-kart-like handling characteristics, with the axle load split in the ratio 49:51 and the vehicle’s centre of gravity located some ten centimetres lower than on comparable sedan models. The price for the Z1 had by now climbed to DM 83,000, but in no way did that deter the buyers. Some 4,000 orders had already been placed, meaning the Z1 was already sold out until the end of 1990. And when the first production models rolled off the assembly line in early 1989, sales contracts that were ready for delivery were already being advertised in newspapers for a premium of DM 20,000. Cult car and trendsetter: star of a virtual film, Art Car – and first in the line of BMW Z sports cars. The roadster’s destiny as a cult car and trendsetter was etched into its cutting-edge monocoque. 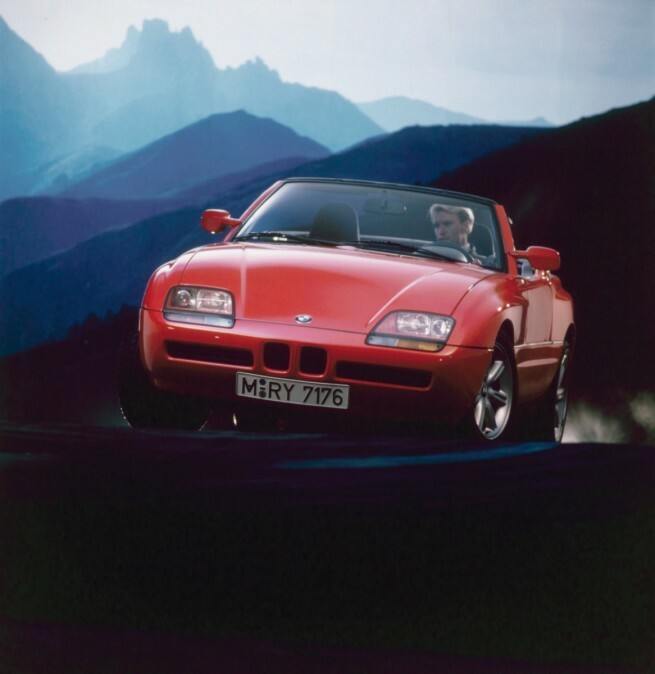 The advertising campaign culminated in the first fully computer-animated product film from BMW, which featured a real-life couple in an actual Z1 gliding through a virtual world for five and a half minutes – wearing, of course, the original soft white leather balaclavas that BMW had specially made for the Z1. In the autumn of 1990, BMW Motorsport GmbH offered the first “Z1 adventure tour” to the south of France, comprising an all-inclusive experience that would be enjoyed “with kindred spirits and in the most exclusive style”: three days in the south of France, a flight in a helicopter, powering around the Paul Ricard grand prix circuit near Marseilles with a chance for participants to hone their driving skills, staying in smart sport hotels. The total price of DM 3,500 even included the Z1 that was provided for the event. A few months later, in spring 1991, the artist A.R. Penck adorned a Top Red Z1 with black graffiti, thereby adding a new member to the legendary series of Art Cars. Another bright red Z1 was destined to stay in the garage though: a roadster boasting a wide, sporty chassis and an uprated engine under the bonnet, the Z1 M was a prototype model from Motorsport GmbH sporting muscular wheel arches, a low-slung front end and twin headlights. Two air scoops arched behind the head restraints, and sitting atop either side of the deep rear apron were two pairs of circular rear lights. In short, the graceful roadster had been transformed into a beefy racer. 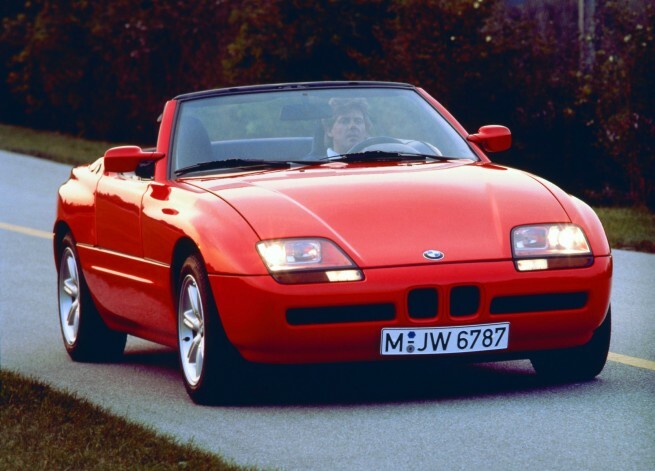 After a run of 8,000 BMW Z1 models, production came to an end in June 1991. It had breathed life back into a segment in the BMW portfolio which continues to enjoy immense popularity today: two-seater sports cars with a Z as their distinguishing letter. The small number that were made, the unique overall design concept and, not least, the tremendous driving pleasure it generated have today earned the Z1 a place amongst the modern classics of BMW automotive history. 25 years on, these cars still have a futuristic look about them and are still in active service: at least one Z1 has a certified mileage of over 330,000 kilometres (205,000 miles). The future never grows old.